There is strong evidence, based on genetic studies, that humanity’s population crashed around 70,000 years ago. If approximations are correct, humanity was reduced to only 5,000-10,000 individuals during that episode so we were definitely on the edge of extinction. Scientists have speculated that either volcanism or a nearby supernova almost wiped out our species. It is very clear that severe climactic change did occur during that period. Most of the science community leans toward a volcanic source (Toba Indonesie) but some believe it could just as easily have had an extraterrestrial source – a supernova. (the cosmic forge). Now, a group of astronomers from the US, Europe, Chile and South Africa have determined that 70,000 years ago a recently discovered dim star is likely to have passed through the solar system’s distant cloud of comets, the Oort Cloud. No other star is known to have ever approached our solar system this close – five times closer than the current closest star, Proxima Centauri. During occasional flare-ups that may have lasted minutes to hours, the dim star’s interloper might even have been bright enough for our ancestors to see. The star’s trajectory suggests that 70,000 years ago it passed roughly 52,000 astronomical units away (or about 0.8 light years, which equals 8 trillion kilometers, or 5 trillion miles). This is astronomically close; our closest neighbor star Proxima Centauri is 4.2 light years distant. 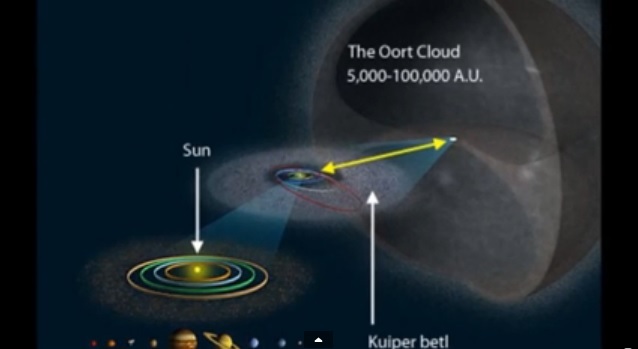 In fact, the astronomers explain in a paper published in Astrophysical Journal Letters, that they are 98% certain that it went through what is known as the “outer Oort Cloud” – a region at the edge of the solar system filled with trillions of comets a mile or more across that are thought to give rise to long-period comets orbiting the Sun after their orbits are perturbed. Any comets that the star might have sent hurtling towards the inner Solar System will not arrive for another few hundred thousand years, however, more-massive stars penetrating the Oort cloud in the distant past might have triggered major comet showers that pummelled the planets and led to some of the mass extinction events on Earth. There is no hard evidence the dim star that passed through the Oort cloud has caused the Toba catastrophe, which has led to a global volcanic winter of 6–10 years and possibly a 1,000-year-long cooling episode, but the fact that both events took place in the same time period, makes it very plausible. If it happened today, the destruction would be widespread and in all probability creatures at the top of the food chain would suffer the most. In other words, Humanity could easily become extinct.